I am a pleaser by nature – not one to ever rock the boat. There are certain topics of conversation that I tend to avoid as a result, with the biggest being politics. This became more difficult years ago when my brother moved to Washington D.C. after graduating from college. He began working in an Illinois congressman’s office. He enjoyed the work immensely, but eventually relocated back home. A job change did not, however, sever all political ties. The essential ingredient in unlearning, I am convinced, is conversation. I came back to this post last night as I listened to the three men speak – and as I had conversations with them myself. Ever the optimistic, I always look for the best in people. Even I, however, can become jaded when thinking of my federal or state governments. I look at our education system and I despair. I examine CCSS or the testing coming our way and wonder if anyone has consulted with teachers when creating this mess. I wonder in my heart if the people in our government are all in this for the altruistic reasons that they say they are. But then I meet with some of these folks – like these two congressmen – and know that there are plenty of people who honestly do want to make this country a better place. Whether on the right side, left side, or somewhere in the middle – they got into this business to help our country. So what has gone wrong? Thinking of Chris’s post, I strongly believe it comes back to conversations. If all of the politicians could leave the capital, attend backyard cookouts and talk to regular people, maybe things would change. Sometimes things in our capital remind me of my classroom at the end of a long school year. A group of people who need a break. I think at times we are more concerned with making sure the other side doesn’t win than we are about coming together for the common good. God forbid we give any ground for fear we might be seen as weak. Listening to the man from Parliament speak, I was struck by the “sameness” in our lives, even though he is from a different country. I thought of Chris’s post, about how in Jordan he found that people worried about the same things we all worry about. I talked to a friend at the barbeque about her newborn son and watched the pride on her face as she shared his new milestones. I talked to one of the congressmen about his child and witnessed the same emotions. I saw these similarities as a result of conversations. I am willing to bet that others could be found if given the time. Our country is large, our problems seemingly insurmountable, but I’m willing to bet if we could find a way to stand in each other’s backyards and talk – we would find friends. I realize it could never be that easy, but this party reminded me of the need to try. The next time I’m frustrated by someone – a colleague, student, parent, or my own husband – I’m going to slow down, breathe, and go back to talk. Find those spots where we have common ground and build from there. Hopefully, one day, those in office can do the same. 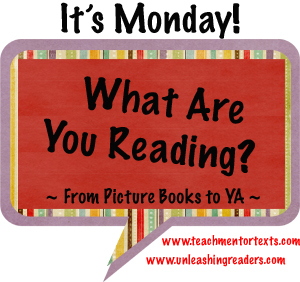 I’m joining Jen at Teach Mentor Texts and Kellee at Unleashing Readers in discussing what we are reading this week. Join us! Go to their site and link up your own blog. So glad I actually remembered to post my “It’s Monday” post this week. 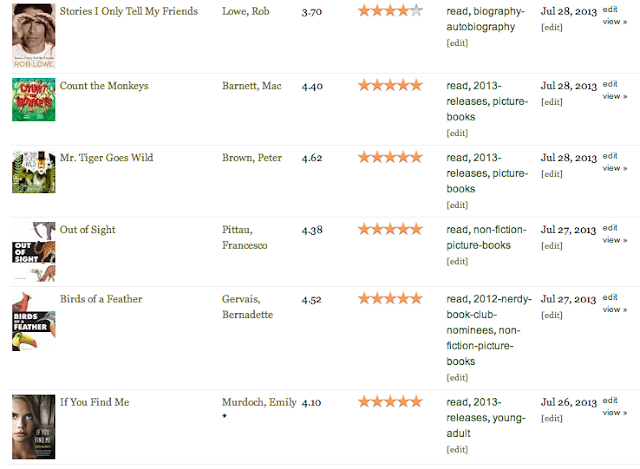 I have been reading this summer – not as much as I want, but am still averaging a bit more than a book a day. 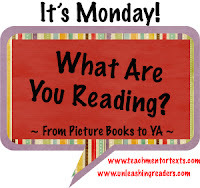 Lots of memorable books this week – Jen Vincent shared Count the Monkeys and Mr. Tiger Goes Wild with me at the Choice Literacy writing retreat. Both are hilarious, and I will be purchasing them for my classroom. 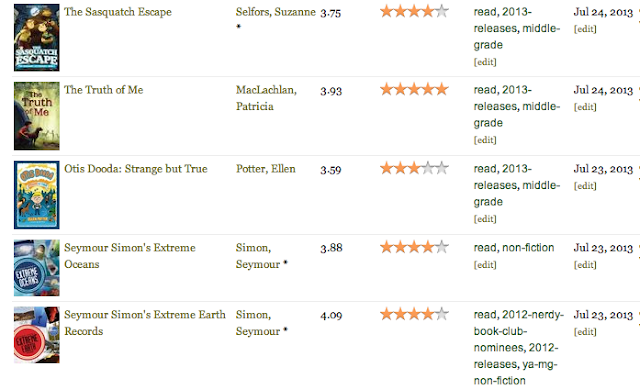 If You Find Me is an excellent YA book. And Out of Sight and Birds of a Feather are both books that had be in spellbound and taught me something as well. Can’t wait to see what everyone else has been reading this week. Oh yikes! 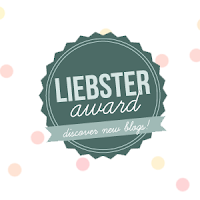 Renee over at Thoughtful Corners was kind enough to nominate me for a Liebster Award. Of course, the nerd in me had to go look up the award – what were the origins? 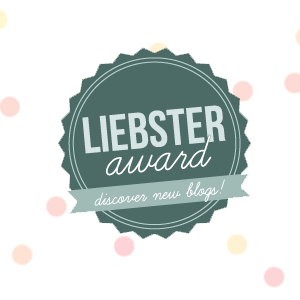 What the heck does “Liebster” mean? I found this blog where the research was done for me. Apparently the award was started by a German blogger sometimes before 2010. It was a way to bring attention to newer blogs. “Liebster” is German for dearest. So thanks, Renee. I’m honored you thought of my blog when selecting five blogs to award. After blogging for a little over a year and a half, I’m starting to figure some of it out. 6. Contact your nominees by commenting on their blog or sending them an email to communicate the nomination. 1. What is one person on Twitter you think everyone should be following? 2. What kind of books are your favorite? 3. What is your favorite food or meal to eat? Either Mexican or pizza, depending on the day. 4. What is one thing you wish you could do over again? I’m pretty ok with everything in my life. I don’t really believe in regrets or mistakes. Everything I’ve experienced has led me to where I am, which is pretty awesome. 5. What’s your best quality? I’m pretty positive and tend to believe the best in others. 6. What would you like your legacy to be? That’s tough. I want to be remembered as a person who loved life and all of the people in it. I want the people I care about – family, friends, students – to know how much I believe in them and cared about them. And obviously, I want to help teachers find their passion and help kids find their way to a good book. 7. If you were a plant/tree, what kind would you be and why? A hosta. I’m pretty low maintenance and tend be someone you can rely on to return. 8. List 3 things you have to have within reach at all times. A drink (water, diet coke), iPhone, and a book. 9. Favorite childhood book and why. Are You There God? It’s Me, Margaret. First book I remember rereading. 10. Quote to live by. 11. Title of a novel you wish you could write. 1. I don’t drink coffee unless it is a mocha. 2. I tend to be shy, unless surrounded by people who know me well. 3. I love being at home. 4. I’ve moved seven times in my life. 5. I’ve lived in my current house since 2001. 6. I house-sat for the people who owned it before us when I was in college. 7. I’m afraid of heights, but have gone bungee jumping. 8. I would love to be an author, but am afraid of failing. 9. I prefer texting to being on the phone. 10. I used to dream of opening a coffee shop and bookstore. 11. My husband says my “uniform” is jeans, a t-shirts, and flip-flops. 1. Favorite item you own? 3. Describe what your ideal day would be. 4. I asked this one on my blog recently – you can invite four people for dinner, but they have to be authors or illustrators. Who would you invite? 5. What would you serve for the dinner described in question four? 7. What book would you consider to be the most important book you’ve read and why? 8. Why did you pick your chosen career? I am thinking a lot about blogging lately. After finishing the Cyber PD book club, I know I want to have my students keep a classroom blog, and possibly their own on Kidblog as well. Today I thought I would just record my thoughts about blogs – this might be a post I end up sharing with my students. I started reading blogs only about five or six years ago. I remember the first one I read was a well known blog – can’t remember the name for the life of me now. I had seen it mentioned in a magazine and wondered what it was all about. Once I went to the site, I figured out this person blogged for a living. What? That was a thing? I was floored that there was this whole sub-culture out there that I knew nothing about. My blog reading has evolved. When I first started following blogs they were around subjects like photography and parenting. I loved teaching, but it didn’t even occur to me that there would be blogs on that. 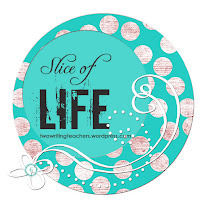 Then I moved on to blogs about families and home décor. About three years ago I discovered the blogs I currently read – mainly focusing on teaching and reading with a little of the former types thrown in for good measure. I read all of my blogs in Feedly. I used to use Google Reader, but that has gone the way of the dodo, and I had to find a new format. I subscribe to so many, it can be overwhelming, although I did whittle the list down to about 140 a few months ago. I rarely comment, more often I retweet a link when I think others should see it. I try and comment back on my own blog, but sometimes I am overwhelmed and don’t get to that like I should. Personally, I think starting a blog is one of the best things I have done for myself. Writing helps me think through what is important. I feel I have become part of a greater community of bloggers and blog readers. And through blogging, I have opened myself up. That can be scary, but it can also be liberating. I think more friends – educators and friends in my area – know me in a way they likely wouldn’t have if they weren’t reading my posts on a regular basis. Hearing from readers who have read what I’ve written – and shared how it made them feel – is amazing. It makes me want to continue to be brave and write. If you are inclined to comment – and no pressure to do so – would you share your thoughts on blogs or blogging? It can be anything – how you read blogs, why you read them, and/or if you do blog – what that has done for you? Trying to assimilate my thoughts on this topic before sharing with my students in a few weeks. Thanks!